Rugged and stylish, the Beacon is designed for comfort even with heavy loads and harsh conditions. An ultra-soft, padded laptop compartment deftly protects and carries up to 18" laptops while still leaving enough room in the main compartment for a gaming console and accessories. Comfort and balance are maintained, even under heavy loads, thanks to the Beacon's 5-point balance strap system and aero-flow padded back and shoulder harness. 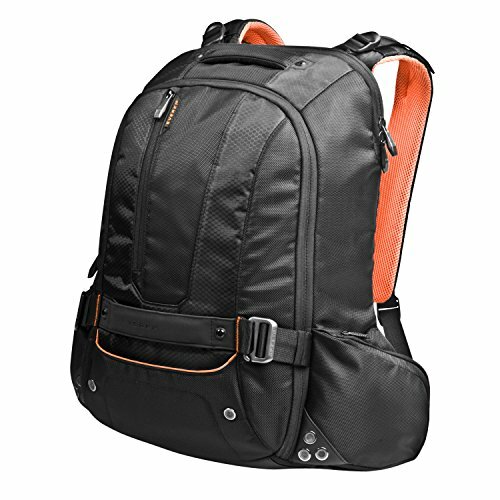 The spacious main storage compartment features a large zippered pocket, dividers, and an assortment of multifunction accessory slots. A clever buckle system allows the compartment to open halfway for quick access or a full 180 degrees for easy loading. Gamers will appreciate the inclusion of a dedicated sleeve for taking a gaming console (XBox 360, PS3, or Wii) on the road. Dual hip pockets provide extra storage and quick access to important items like keys, mobile phone, or a media player without taking the bag off. A zippered outer pocket and a quick-stash slot provide additional easy-access storage To keep your valuable contents protected in all weather conditions, the Beacon has an integrated stow-away water-resistant weather cover for use in sand, snow, rain, or dust. As with all Everki products, the Beacon is backed by Everki's Limited Lifetime Warranty and world-class customer service.